News flash: Social media aren't going anywhere. Just check the numbers. • Facebook has nearly 1.2 billion users, while Twitter and Google+ each has around 500 million. • Instagram, a Facebook-owned mobile picture- and video-sharing app, boasts 150 million active monthly users. • Vine, a barely year-old Twitter property on which people can shoot and share 6-second video clips from their smartphones, has more than 40 million users. Instagram responded by adding video capabilities and upping the ante to 15-second videos. 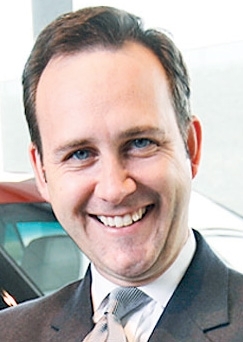 Automotive marketers and sales executives salivate at the idea of influencing the growing contingent of connected consumers on social networks, but Ford's Scott Monty says there's more to social media than hawking products. The industry must do better at listening to consumers, answering their questions or adding value to their lives, says Monty, the company's global digital and multimedia communications manager. Monty, 43, discussed his outlook on the social sphere with Staff Reporter Vince Bond Jr.
Q: What excites you most about social media going into 2014? A: I think the biggest thing for 2014 is in terms of opportunity because you look at the sheer number of people that are on some of these platforms now. Facebook is nearing about 1.2 billion; Twitter and Google+ each have about 500 million; LinkedIn has about 250 million and I know they're making a strong play for China next. It's an international phenomenon. It seems to be a more universal phenomenon than it was two or three years ago. In 2012, Instagram was the big thing. Last year, it was Vine. What new platform is emerging in 2014? I think those platforms are still very ripe for exploring. The other one I hear a lot about is certainly Snapchat. ... I think they're something we need to pay attention to. The conundrum with Snapchat is the images only last 10 seconds. What brand doesn't want its message to last? It's a little bit counterintuitive. ... The reason I'll mention that one in addition to what I think is very important, which is Instagram and Vine and, frankly, the Flickr mobile app, is visual communications. Visual communications are so important. You think about what you have time for in your day. If you're flitting from one to the other, or if you're just standing in line in the grocery store, what are you doing? You're flipping through your phone. You're usually just looking quickly at images. You're not reading a New Yorker length article by any stretch of the imagination. That level of emotionally charged, visually arresting content that doesn't take a long time to digest is extremely important. What kind of industry are we in? We're in an extremely visual industry. People love to see our products. The great part about Ford is we can play it up from a new product intro. We can play it up from a heritage standpoint. People love to see our old photos. We can take people behind the scenes. We can give them a day in the life. Visual communications is going to continue to dominate into 2014. What did you learn last year that you hope to build on this year? The immediacy of response is extremely important. We've had a customer service team that is lightning fast in terms of handling people that have issues. But now I think people are looking for more day-to-day interaction, more content creation on the fly. Is customer service becoming a huge part of social media? I think it has become a necessity in social. I think consumers now, particularly the more connected consumers, will just as soon turn to Twitter or to Facebook and try to get a response there than they would be to use the 800 number. The bottom line is none of this is going to replace anything. It's simply a matter of having to be in more places. Does the auto industry -- from dealers to manufacturers -- finally realize that social media are here to stay? I think it's safe to say that. I still think we have to do a better job of listening -- listening to what the consumer wants, listening to what the consumer is saying about our product -- rather than being so focused on what's the next platform we're going to use to go advertise. Because that's where the value is. I saw [a someecards.com card] a couple years ago, which had a couple people talking in an office setting. The caption was, "Let's ruin something with advertising." I get the feeling that if we don't just stop and ask ourselves, "Should we be doing this?" before we say, "We can do this," then we're shooting ourselves in the foot. Ultimately, our job at Ford is to help build the company's reputation and build purchase consideration. In doing so, we don't do that by just blasting people with ads. Maybe we provide value to them in some way. Maybe we help them answer a question or settle a debate or make them laugh. How do you feel about Facebook's auto-play videos on people's news feeds? Are they intrusive? Facebook gets a lot of heat for the advertising decisions they make. Marketers bear some of the brunt, too, because we're the ones creating the content. If we create something that feels like an ad and feels like it's intrusive, then of course, people are going to be turned off. Whether or not it's auto-play, it's up to us to create something that fits within the expectations of that community. With so much tracking technology out there, do you have to be careful not to spook people with your advertising? I think that's one of the bigger challenges right now. On the one hand, people are objecting to giving up more of their information, but at the same time they're desiring more personalized experiences. How are you going to get one without the other? And ultimately, we need to respect that. We need to understand that this may not be for everyone. ... If someone did a search for a particular vehicle in a particular ZIP code, let's try to connect them with the right people. But let's not seem like we're looking over their shoulder.